This is a very fast, simple dish to make. Have everything assembled and keep a steady eye on the eggplant as you fry it. It browns quickly, barely 1 minute per side. I came periously close to having my skillet catch on fire when oil splashed onto the burner, as I laid in a breaded eggplant slice. But, why not a little drama? It was worth it. I also made a few without the top layer of eggplant. Delicious! Oh my, that looks delicious! I am bookmarking this one to try VERY soon... yum!! Yum! Eggplant: check! Goat cheese: check! This has been copied and pasted... Would make a great first course. 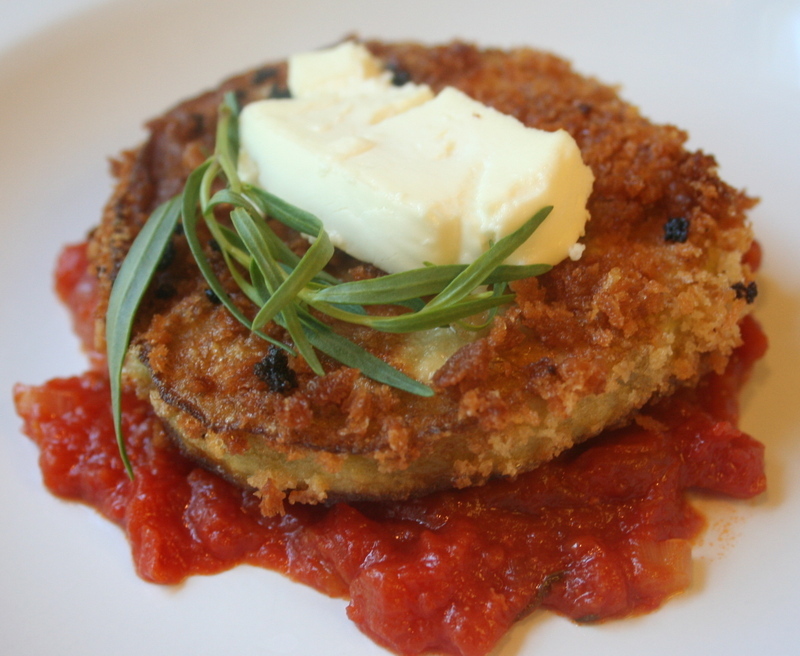 I like tarragon with tomato sauce - Just a hint of something new... and, of course, my favorite goat's cheese! OMG, I'm in heaven. I love all of those ingredients. I have to make this. More goat cheese, please! Oh my heart be still because my tummy is up in arms! Whohoo that looks fantastic Wow. I'm off to get an eggplant although I may have breakfast first. Sher this is way good. Just wow, wow, wow. I love everything about this. And they have 100% whole wheat panko so I can even make it friendly for my diet! Woo Hoo. Sher, you have outdone yourself on this one. Oh I wish there was goat cheese here! That looks seriously yummy! Awww, thanks, Sher. You're a sweetie too. :) And these whoopie pies areaking me jump up and down with delight. 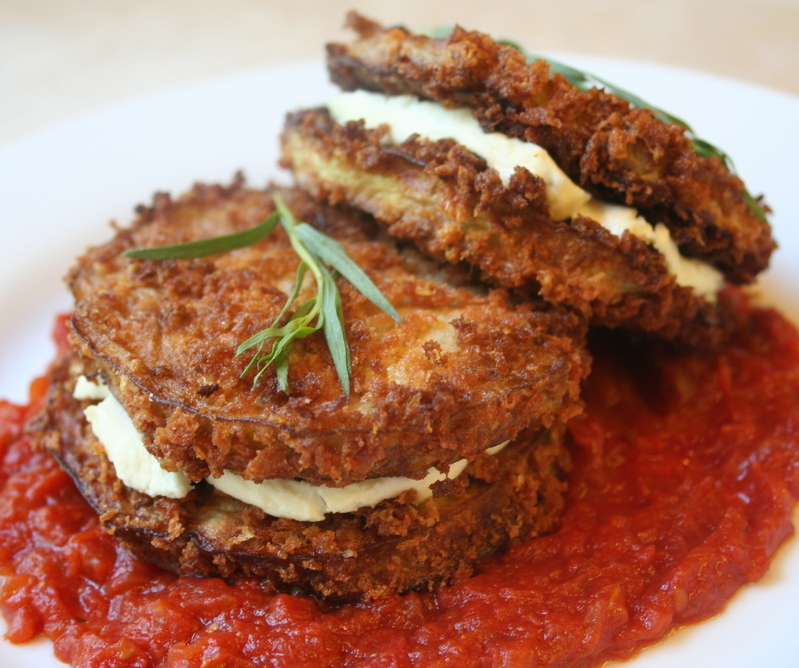 I adore eggplant, and with the tarragon-tomato sauce--oh, my--is it lunchtime yet? Thanks for the delicious WHB entry! It is -- it is -- an eggplant whoopie pie! Such a nice presentation of this combination of ingredients. This looks outstanding! 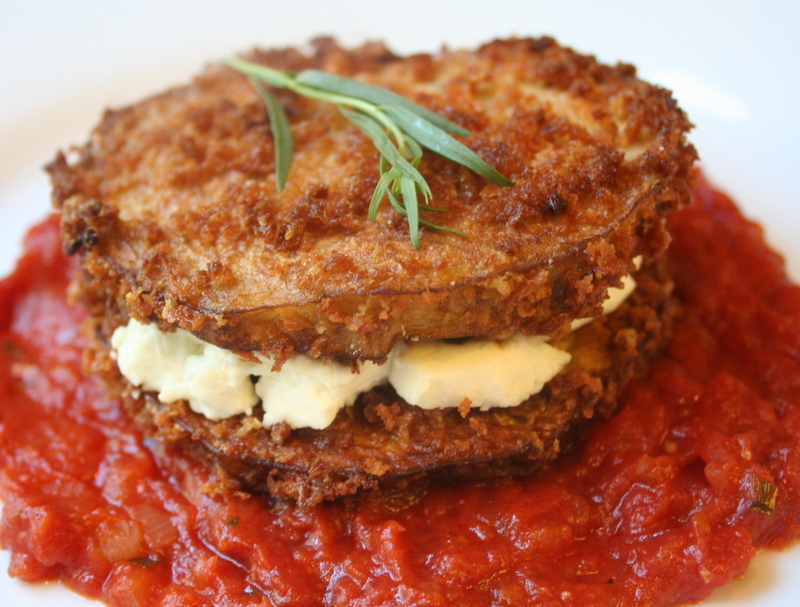 I love the color contrast of the white goat cheese between the brown panko-ed eggplant, plus the red of the sauce. A feast for the eyes as well as the stomach. I am so fascinated by these. I bet they are great! Oh boy. This looks so yummy. I really shall try to make this dish...maybe next weekend. ooooh ... this is super good and with goat cheese ... yummy for my better half :) I have to try it out for him. Wowie, that looks insanely delicious! A little drama indeed, glad nothing caught fire. You've had enough heat in Sacramento lately! Wow .. this looks fantastic! I made eggplant this week also but didn't sandwich it with cheese. Great idea! My goodness, that looks perfect! Do you think that I can bake the eggplants instead? I'm not a fan of frying because I'm not good at it (oil goes everywhere) and I have no patience. If I can stick it in the oven, that would be great! This has to be one of the most gorgeous things I've ever seen done with eggplant and goat cheese -- two of my very favorite foods! Thank you so much. I love the read that I've been bookmarked! Luckily--it was also delicious tasting, as well as looking good! I love Whoopie Pies too! And this would make a great first course. Yes, I also thought of the whole wheat panko. I sure love it! Ahhh--I wish you and Kami had some goat cheese to share. Thank you for doing such a great job hosting. Thank you--the pretty colors were the thing that made me wnat to make this. Yum--those Spanish eggplant sandwiches sound great. They really were great--and easy! Oh good! I hope you enjoy them. Great! I do hope you and your better half enjoy them! Thanks--anything is better sandwiched with cheese! I think that would be a good experiment! I've "fried" eggplant in the oven before, and it tasted great. Great! By the way, I saw your beautiful ratatouille. It's fabulous! This just looks really fantastic. I never think to put goat cheese with the eggplant...nice. That looks really good, my husband would love that! (And maybe me, too!) Will try it soon! Wow - and what do I WANT to eat? THAT!! I spotted this on Taste Spotting and I have to say, with this blog entry alone, you have me bookmarking your blog and coming back for more. Great photos and recipe! To second just about everyone before me, I love all of these ingredients! It looks so crisp and delicious, Sher! Sher, I like the way that you have written your entry, it reads just great. As for the whoopies (which I have never heard of before) I am looking forward to try them. They do look absolutely gorgeous. P.S Tarragon and tomato, just great. oh my god! they look like eggplant whoopie pies! how awesome!